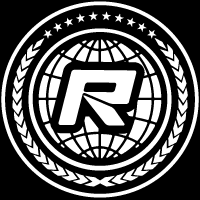 The 2018 US Open Championship was held at Sun City RC Raceway in Canutillo, Texas on an old school, loamy dirt track. It was packed well and smooth and the shape of the track was a little different from the usual as it was 180 x 180 which made the back lanes far away and a little challenging to get through because of the distance. 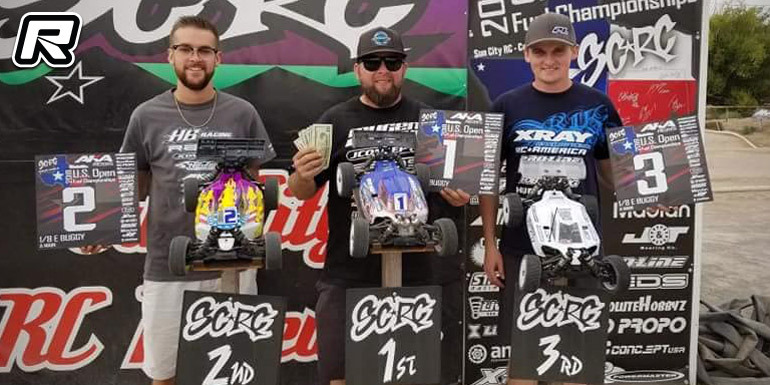 In the Nitro Buggy class and after the semifinals it was Mugen’s Ryan Maifield with the pole position for the main final from Ty Tessmann (Xray) 2nd and Cole Ogden (HB Racin) 3rd. The main was 60 minutes, so to would be good practice for the worlds. As the main started Ty was feeling pressure from Cole while trying to stay with Maifield and Tessmann started to push a little bit too hard and was hitting ruts that he shouldn’t have been. Cole would get by him, but then Ty settled down and just drove clean lines and slowly caught up to Cole again and passed him, then Maifield made a big mistake and Tesmann got by him and he would continue to create a bigger gap throughout the race and was able to hold onto the lead for the remainder of the race for the win in front of Cole Ogden and Ryan Maifield. The E-Buggy final was one single 10-minute race. 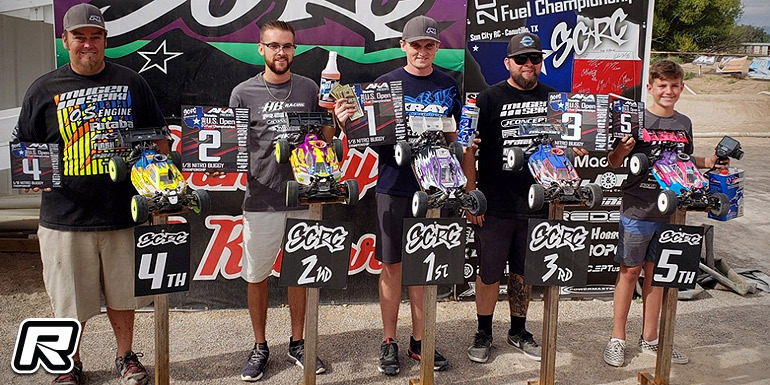 It started out dicey, and Mugen’s Ryan Maifield would gain a small cushion, leaving Ty Tessmann (Xray) and Cole Ogden (HB Racing) battling for 2nd with Cole’s body falling off. Both caught up to Maifield slightly, but due to the changing track conditions, Ty and Cole both would make a few mistakes. Back to 3rd and entering the closing laps, Ogden passed Tessmann for 2nd with one lap left and was able to maintain until the end.